How should I transport or store my product? If you need to store your product or transport it a long distance, prepare it for transportation as described here. Avoid tilting the product, placing it vertically, or turning it upside down; otherwise ink may leak. Leave the ink cartridges installed. 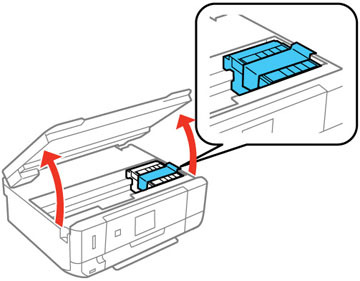 Removing the cartridges can dry out the print head and may prevent the product from printing. Do not carry the product by its control panel; this may damage the product. Note: Before storing your product for a long period, replace low, expended, or expired ink to help prevent the print head from drying out. Store your product in a cool, dry place. Lift up the scanner unit and check to see if the print head is in the far right position (the home position). If not, turn on the product, wait for the print head to move, then turn the product off again. Secure the ink cartridge holder to the case with tape. Do not place tape on the white flat cable inside the product; otherwise, you may damage your product. Remove all the paper from the product. Remove any memory cards inserted in the product. Close the output tray and front cover, then lower the control panel. Place the product in its original packing materials, if possible, or use equivalent materials with cushioning around the product. Keep the product level during transportation. Be sure to remove the tape from the ink cartridge holder before turning on your product. If print quality has declined when you print again, clean and align the print head. Published: 1-Aug-2016 Was this helpful​? Thank you for the feedback!